Thomas Aquinas (1224-1274) is one of the towering figures in Western philosophy and theology, so great that he is even called the “angelic Doctor” by the Roman Catholic Church. Within a twenty year span he wrote over forty books, including his masterpiece The Summa Theologica, in which he constructs a vast system integrating Greek philosophy with the Christian faith. In the second part of this great work, as well as Book 3 of his shorter volume Summa contra Gentiles, he sets out a systematic answer to the question of what human happiness is, and whether it can be obtained in this life. His ultimate answer is that perfect happiness (beatitudo) is not possible on earth, but an imperfect happiness (felicitas) is. This puts Aquinas midway between those like Aristotle, who believed complete happiness was possible in this lifetime, and another Christian thinker, St. Augustine, who taught that happiness was impossible and that our main pleasure consists merely in the anticipation of the heavenly afterlife. Aquinas was ultimately assigned as a lecturer to various Dominican houses in Italy, but his real task was the masterpiece, his Summa Theologica, “The Summation of All Theology,” which sets out an entire book dedicated to the question of happiness. For twenty years Aquinas worked on this project, but on a night in December 1273 after celebrating Mass he experienced a mystical vision that shattered his entire aspirations. After that night he never wrote another word, and he died six months later. On his deathbed he is reported to have pointed to all of his books and said “After what I have experienced, all that is just straw.” As we shall see, this is most ironic when considering Aquinas’ views on happiness, since in the Summa one of his main conclusions is that true happiness consists in a mystical (beatific) vision of God that is only possible in the afterlife. Already in his Summa Contra Gentiles, Aquinas had taken a position similar to St. Augustine’s, that perfect happiness is not possible in this lifetime. Aquinas takes seriously St. Paul’s assurance in 1 Corinthians 13:12 that “for now we see as through a glass darkly, but then we see face to face.” This world is too plagued with unsatisfied desires to achieve that ultimate good which we all seek by nature. Furthermore, God has basically created us with a desire to come to perfect knowledge of Him, but this is hidden from us while in our mortal bodies. True knowledge of God would require being able to see him directly, but this is only possible by a completely purified soul. When this occurs, we will experience the ultimate pleasure—a pure and everlasting bliss that will be the satisfaction of every human desire and the obliteration of every sadness or worry. While the perfect realization of Truth will only occur in heaven where we will perceive God “face to face,” there is an imperfect counterpart of that vision here on earth. Thus Aquinas is lead to make a distinction between “perfect happiness” which he calls beatitudo, and “imperfect happiness” called felicitas. By making this distinction, Aquinas is able to tone down the pessimistic view of human nature expressed by St. Augustine, including the doctrine of Original Sin. As Aquinas writes, “Human Nature is not so completely corrupted by sin as to be totally lacking in natural goodness.” We have an impulse in us that seeks God and other impulses that pull us down to worldly pleasures. However, it is possible to begin the process of healing in this lifetime by exercising the natural virtues that Aristotle talks about—the virtues of wisdom, courage, moderation, justice, friendship, etc. Furthermore, God in his grace has now revealed to us three additional virtues: those of faith, love and hope. These will pull us through to the final end so long as we begin the effort. This passage illustrates well Aquinas’ unique blend of rigorous logical reasoning with his use of Scripture which reveals to us the same truth through other means, in this case the mouth of the prophet. Nothing can contradict the Truth: hence if Reason and Revelation are valid pathways to truth, they must ultimately be reconcilable. So Reason confirms to us what we already know deep down in our hearts: that our ultimate desire lies in absolute perfection, which can only be found in God, the absolute Being. Thus for Aquinas we must make a sharp distinction between enjoyment and happiness. Enjoyment pertains to worldly goods and physical pleasures: but these tend to be very short-lived. And even if all of our worldly desires were satisfied—even if we were to experience every possible enjoyment—we would remain unhappy, since we would still have a nagging feeling that something is missing. Today Aquinas would point to the experience of many rich people and celebrities as evidence for this truth. Despite having every worldly good—fine foods, cars, houses, vacations, friends, family—many of them remain deeply unhappy, even spiraling into the misery of drugs and suicide. Aquinas would explain this as follows: when every enjoyment is felt, the soul begins to crave for something more than mere enjoyment. But if one has no knowledge of this “something more” or doesn’t know how to go about finding it, the enjoyment turns to pain and suffering. This also explains why we see a lot of billionaires suddenly change towards the middle or end of their lives: that nagging feeling that there is something more results in charitable work or an orientation to a higher purpose in life. One might, however, question Aquinas’ insistence that perfect happiness is only possible in the afterlife. Is it possible to purify the soul in this lifetime, so that one can possess a direct experience of Ultimate Reality? The Buddhists and Hindus certainly think so: they can point to certain individuals such as the Buddha who have obtained absolute enlightenment. And there is a mystical side to monotheistic religions like Christianity, Islam, and Judaism as well, according to which the ultimate goal is Oneness with God, which has been attained by various saints or prophets throughout history. Aquinas’ own mystical experience at the end of his life might be just such an example: perhaps he actually achieved a beatific vision of God, a vision so strong that it rendered all of his words obsolete. There can be an imperfect happiness (felicitas) attainable in this lifetime, in proportion to the exercise of Reason (contemplation of truth) and the exercise of virtue. Virtue is to be divided into two categories: 1) the traditional Aristotelian virtues of wisdom, courage, moderation, friendship, etc., and 2) the theological virtues revealed to man through Jesus Christ: faith, hope, and love. There is an important distinction between enjoyment and happiness. Enjoyment concerns satisfaction of worldly desire. Happiness concerns obtaining our absolute perfection, which by definition can only be found in the absolute Being, which is God. Aquinas, Thomas; Mary T. Clark (2000). An Aquinas Reader: Selections from the Writings of Thomas Aquinas. Fordham University Press. Aquinas, Thomas (2002). Aquinas's Shorter Summa. Manchester, NH: Sophia Institute Press. Davies, Brian (2004). Aquinas: An Introduction. Continuum International Publishing Group. McMahon, Darrin (2006). A History of Happiness. Atlantic Monthly Press. 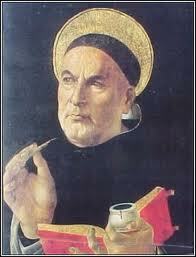 One Response to "Thomas Aquinas"
Thomas Aquinas is one of my favorite theologians. I think the author is on to something in saying “perhaps he actually achieved a beatific vision of God, a vision so strong that it rendered all of his words obsolete.” But, I think the conclusion oversimplifies. If we are speaking of a happiness with the living God, such cannot be fully experienced from one’s deathbed. That is, the divine, supernatural, wholly spiritual God cannot be engaged while the human spirit is still joined to the physical body. Such a beatific vision would likely be far greater ‘beatitudo’ than Aquinas thought possible to experience on earth, yet even greater still would it be on the other side of the veil. I prefer to think of the ‘beatitudo’ as the Christian joy, and ‘felicitas’ as happiness. Happiness may be fleeting, or last through most of life in practice and memory, but joy is permanent. Some degree of pure, unadulterated felicitas-joy is attainable in this life, as attached to the virtues of faith, hope, and selfless love. Yet, steadfast dedication to the Aristotelian virtues must have the potential to grant such whole satisfaction that it would seem a perfect happiness, if only attained for a short time. The imperfection of this beatitudo-happiness is only as limiting as the imperfection of this world. Perhaps Aquinas certainly did underestimate the attainability of such happiness.